Picture this: a pound of sugar, a pound of butter, and a pound of flour. Add eggs, cream together, bake, and enjoy. Enjoy fresh; enjoy the next morning toasted in a skillet with a little butter. Enjoy the decadence that is pound cake. Now, picture this: the same pound cake in all of its buttery glory, but even more moist because you’ve added a cup of pureed pumpkin to the batter. It’s slightly sweet and rich, and a spiced glaze that combines the holy trinity of fall spices: ginger, nutmeg, and clove. 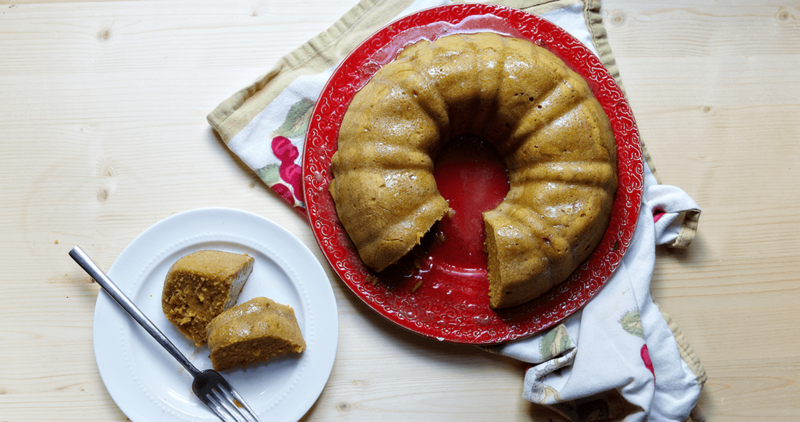 Enjoy the decadence that is pumpkin pound cake. Right? It’s a great idea. Perhaps you’re thinking that there are a lot of pumpkin spiced things on the market. Maybe you’re feeling a little overwhelmed. You might just want to write it all off and wait for gingerbread. Hey, I hear you. In fact, I know exactly how you feel. “Pumpkin spice” has become synonymous with “very sweet, orange, and a cinnamon overload.” It’s not great. But this pound cake is. This pound cake is subtle, full of flavor, and will make you reconsider all of your preconceived notions about America’s favorite fall spices. And if you replace the milk in the glaze with bourbon, this pound cake will reach a completely different level of dessert. Preheat the oven to 350 degrees. Beat butter in a large bowl and gradually add sugar, beating until light and fluffy. Add eggs, one at a time, whisking well between each addition. Add vanilla extract. Sift together flour, baking soda, and spices in a bowl. Add to the egg mixture, one third at a time, alternating with pumpkin. Spoon batter into a greased 10-inch bundt pan. Bake for 40-45 minutes, or until golden brown and firm. Allow cake to cool for 10 minutes before turning out onto a plate. Whisk together milk (or bourbon), sugar, and spices. Slowly pour the glaze evenly over the cake. Serve warm.